good reviews on alot of these not only 3 for 2 but also alot reduced. 925 Sterling Silver stud earrings expertly made with sparkling Tanzanite crystal from SWAROVSKI Sterling Silver setting, post and scrolls stamped 925. The earrings measure 6mm x 6mm. London box. 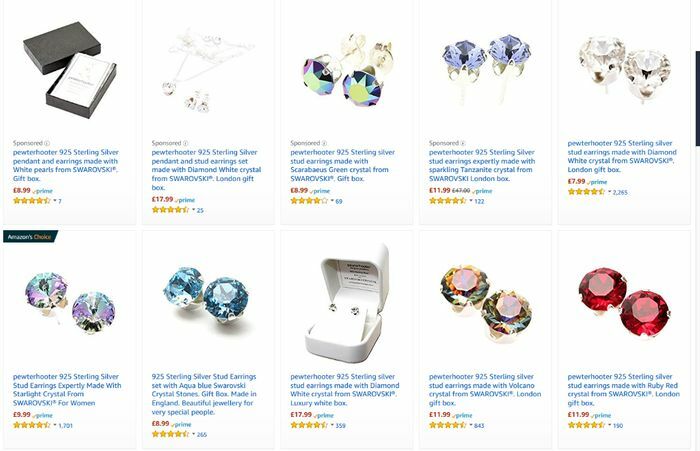 QUALITY: pewterhooter jewellery is made in London, England with 100% Genuine crystal from SWAROVSKI. SWAROVSKI make the finest crystal stones in the World in the most beautiful vibrant colours. Guaranteed to sparkle and glitter in any light. BUY WITH CONFIDENCE: The pewterhooter brand is founded on great customer service. All pewterhooter orders are shipped out directly from Amazon fulfilment centres giving you fast next day delivery for prime members. With easy Amazon returns you will never be left with a product you do not like. Buy without risk - our customers enjoy a 1 year hassle free money back guarantee. PRODUCT IMAGES: Swarovski crystal sparkles so brilliantly it is very difficult to photograph. My pictures do not do justice to the beauty of each piece. SWAROVSKI make the finest crystal stones in the World in the most beautiful vibrant colours. Guaranteed to sparkle and glitter in any light. I offer all my customers a full refund if they are not 100% happy with their orders.